Find franchises by local availability using the regional or postcode options, all throughout the UK. Click a region and drill down by UK postcode. 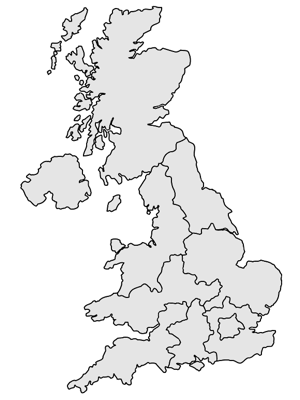 RetailFranchise utilises a ten-region UK territory map, to break down the UK into fairly even sections. Within each region, you can explore franchises for sale, even exploring availability on a local postcode basis. Franchise companies are able to define locations that they are especially seeking franchisees within, or alternatively, if they dont have availability in a certain location, you may not see their opportunity listed. Franchisors break down their territories in many different ways however so although a franchise may be listed in a specific postcode location, it is not a certainty of availability, and also local research will be required to assess viability of a business in any one location. This can be explored with the franchisor. Find out which franchises are available in your location by selecting a postcode. Either use the regional map to open up all postcodes within, or select from the text list.